Please click on the link to go to the appropriate page. Please e-mail the author before using any photo in a website or publication. Our most used start point. Picnic site just outside Toddmorden with Summit Tunnel and Viaduct at the back. Great Rock on the Calderdale Way. Our favorite lunch stop! the views are great across to Stoodley Pike! ---plus 3 views of Stoodley Pike. The Pike from the Pennine Way. Taken from London Rd below the Pike before the climb up! The Pike from Warland Reservoir. At lunch at some rocks behind Warland Res. I could not resist this one! The Pike from the White House Pub. On the Pennine Way next to Blackstone Edge Reservoir, on the way to Warland Drain. Two Walkers in the Dale. Eric Carter and Myself (right) by the river. Autumn Colors. Mid afternoon sun hits the turning leaves. Clapper Bridge The bridge near the Tea Rooms at Bradford. The Gorge and Big `E` On the Limestone Trail near One Ash Grange. Bridge and River Again, The Limestone Trail on the River Bradford near Middleton. Footbridge on Kirklees Way at Cox Clough. Looking down on Holmebridge from Ramsden Rd. Holme Valley and Black Hill. The Kirklees Way at Reynard Clough. Ivy`s Cafe at Holmefirth-Scones and Coffee! Bill Ward on stile on the Pendle Way. And Trig Point on Top! Lower Ogden Res- Barley end. And from Higher Ogden Res. Eric Carter- Long Time walking Buddy- with Pendle at back. And again- Lost I mean! Dovestone Res. and Saddleworth Edges Photo's. Alderman Hill from Oldham Way. Bottom of Greenfield Brook/Birchen Clough Cascades. Eric Carter, climbing up the cascades. Top of Greenfield Brook/Birchen Clough Cascades. The Balanced Rock on Ravenstones. Dovestone Reservoir from Saddleworth Edge, near Great Dove Stone Rocks. Chew Reservoir, the highest in GB. The River Tees, from Middleton to Couldron Snout Photo's. For a write up on this walk, go to Tees walk. The Sun rises for us on a 7 o'clock start, and the first stile of the day. --- and I snapped this Tree Troll just after! Low Force, the first of the Days waterfalls. 4 pics of High Force. Part of the Tees Valley from Bracken Rigg. In the opposite direction, Birk Rigg, (part of the return journey) from Bracken Rigg. The most impressive of the Falls, Cauldron Snout. Cauldron Snout in the background, taken from Cronkley Fell on the return journey. Sunset over the Beck near Middleton as we finished our walk! We made a friend as we ate our lunch near High Force. 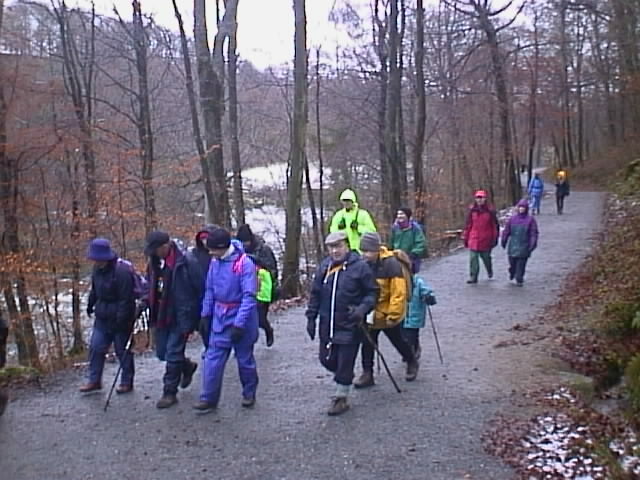 Winter 98-Our annual winter walk, with the 22nd Warriors cub Scouts. Over the bridge at Barden-Yes, that is Snow. ---and our lunch stop on the other side. Winter 99- Again our Annual walk, Winter sun on the Abbey. Some of the other Cub Leaders and Parents on the walk. 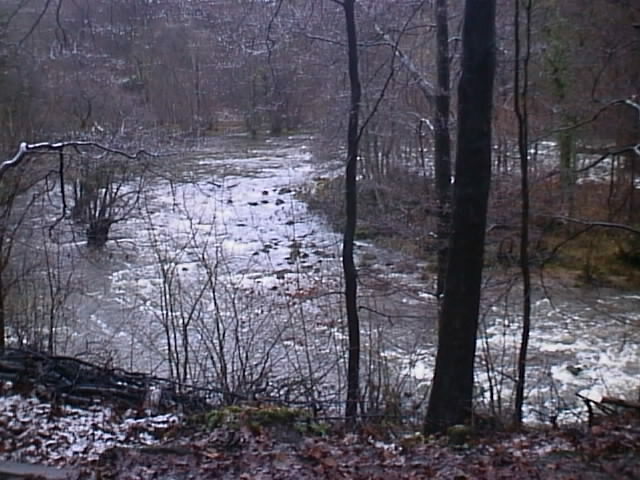 A very cold winter river scene!